The latest issue of the Automotive News Europe monthly e-magazine goes live on Monday, April 4. 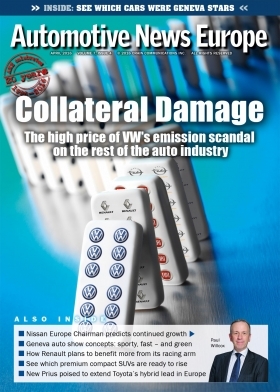 This month's edition looks at the backlash all automakers are facing in the aftermath of the Volkswagen Group's diesel-emissions scandal. Ever since VW Group admitted to cheating pollution tests on an unprecedented scale, Europe’s auto industry has scurried to contain the reputational fallout from the public health risk from nitrogen oxide emissions and to deflect criticism from diesels, which are considered critical to meeting CO2 reduction targets. “The problem created by Volkswagen has had a huge impact on the credibility of the automotive industry as a whole,” PSA/Peugeot-Citroen CEO Carlos Tavares said. A cloud of suspicion has descended on the industry that has left automakers struggling to shape the public debate. More red tape, stricter testing regimens and greater scrutiny as a result of the VW Group’s fraud are only the beginning. VW Group isn’t the only automaker having to explain excessive NOx emissions from its diesels, especially in Europe. The International Council on Clean Transportation, the nonprofit group that helped expose VW’s cheating on emissions tests last year, says on-road NOx is much higher than it should be. ICCT Senior Researcher Vicente Franco provides insight into the problem. While the VW crisis has contributed added pressure to diesel, one potential victim of the scandal might surprise you. Rinaldo Rinolfi, who is one of Europe’s pre-eminent powertrain experts, told us that full hybrids and plug-in hybrids will suffer most from the move to real world emissions tests for vehicles. When I asked Rinolfi, who is one of the fathers of the common-rail diesel, which powertrain he believes is the greenest, most affordable option available today he said compressed natural gas. I decided to test this myself and learned that CNG has a lot of potential but one big problem to overcome. Nissan Europe Chairman Paul Willcox wants to boost the brand’s profile in Europe, where awareness remains low despite the success of its crossovers. To achieve this Nissan will move its Qashqai even further upmarket. Renault picked 36-year company veteran Jerome Stoll to increase the transfer of technology from the automaker’s successful racing teams to its production vehicles. Stoll recently shared his plans with us. Porsche finance chief Lutz Meschke says that the sport car maker’s 15 percent profit margin target is a “sacred cow” that will remain in place as part of its new 10-year business plan, despite facing huge investment challenges as it moves toward e-mobility. Mercedes-Benz makes a big leap toward self-driving cars with the new E class, which debuts a hands-free lane-changing function that even the brand’s S-class flagship does not offer yet. Find out what other new cutting-edge technology Mercedes will offer in the car. Toyota expects to solidify its position as the region’s leader in hybrid sales with the new Prius, which the automaker says is greener and more fun to drive than its predecessor because it has better aerodynamics and a lighter, more efficient electric motor. Renault Connected Car Director Thierry Viadieu is confident that his company will be in the car business a decade from now. He is less sure that will be the case for Google and Apple. He explains why. Autonomous driving, car-sharing and e-powertrains are megatrends that are shaking up the car industry. Valeo CEO Jacques Aschenbroich’s mission is to make sure the French megasupplier evolves fast enough to keep pace with the changes. Also, don’t miss our Car Cutaways supplement, which highlights the contributions of partsmakers such as Robert Bosch, Continental, BorgWarner, GKN Driveline, Webasto and ZF Friedrichshafen -- to name just a few -- to 27 key new models. It also goes live on Monday, April 4.